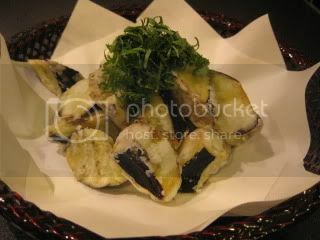 HAPPY DONABE LIFE - Mrs. Donabe's Rustic Japanese Kitchen: Sansho Eggplant! This dish is so light on a palate with a nice thin crisp skin. I can keep snacking on it without wanting to stop. The aroma of sansho is very appetizing, too. Here's how I make it. 1. Cut off the heads from 3-4 medium-size Japanese eggplant. 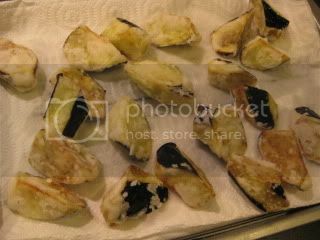 Peel the skin in stripe and cut each eggplant into oblique. 2. Soak them in cold water for 10 minutes. Drain and pat dry. 3. Toss the eggplant in 3T potato starch. Shake off excess powder. 4. 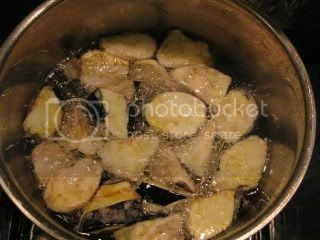 Deep-fry the eggplant in 170F oil until light-golden for 5-6 minutes. Increase the heat to high and cook for an additional minute. Transfer the eggplant to a vat, lined with paper towel. 5. 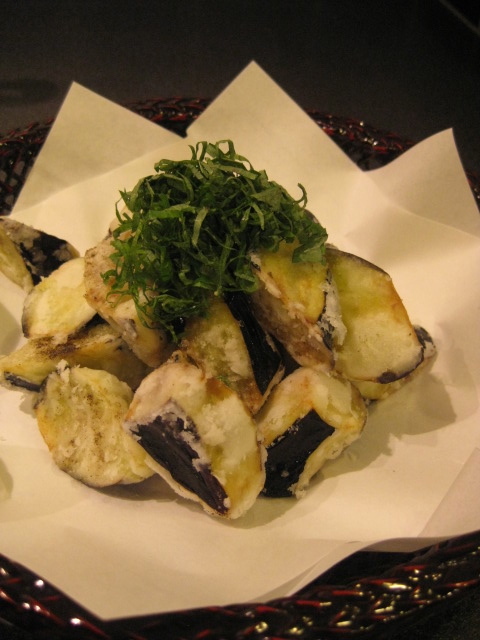 Arrange the eggplant in a plate and season with some sansho pepper powder and Maldon sea salt. Garnish with thinly-sliced shiso leaves.